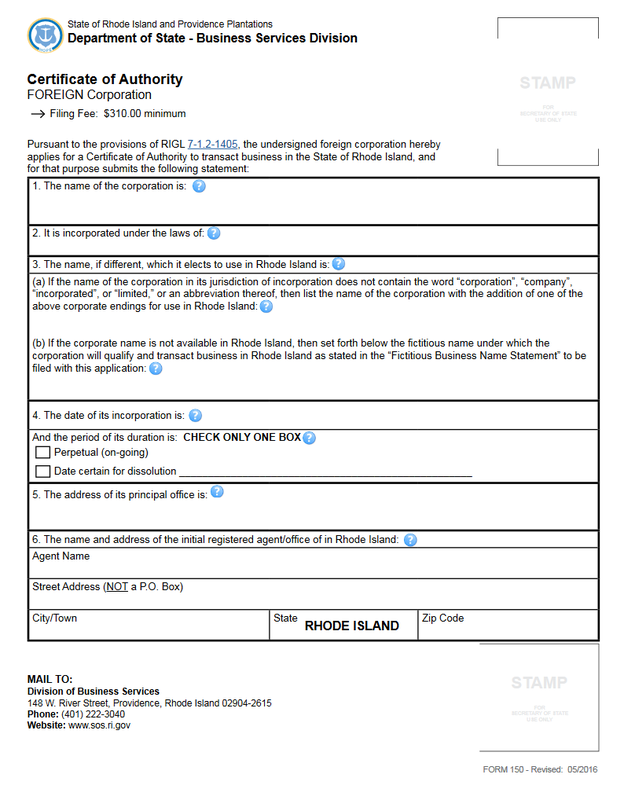 The Rhode Island Application for Certificate of Authority by a Foreign Business Corporation | Form 150 should be submitted with a Certificate of Good Standing/Letter of Status to the Rhode Island Secretary of State. The Certificate of Good Standing/Letter of Status must be obtained from the parent state of the applying corporation bearing a date of no more than sixty days before the filing date. This is staunch requirement as it will aid the Rhode Island Secretary of State Business Services Division in verifying the corporate status the applying entity already possesses as well as several other factors. There may be several other requirements to be fulfilled depending upon the type of entity that is applying for this certificate (i.e. foreign professional corporations generally will need to apply for license to deliver their specific services in this state. Filing entities should make every effort to be familiar with the process of gaining a Rhode Island Certificate of Authority. Step 1 - Select the link labeled “Download Articles” or click here: Form 150 to download the Rhode Island Application for Certificate of Authority for a Foreign Business Corporation. This form should be typed or printed. If the filing entity must operate under a fictitious name (see instructions for Step 4 below) then, you should also select the above link, “Download Fictitious Business Name Statement,” or click here: Form 624. 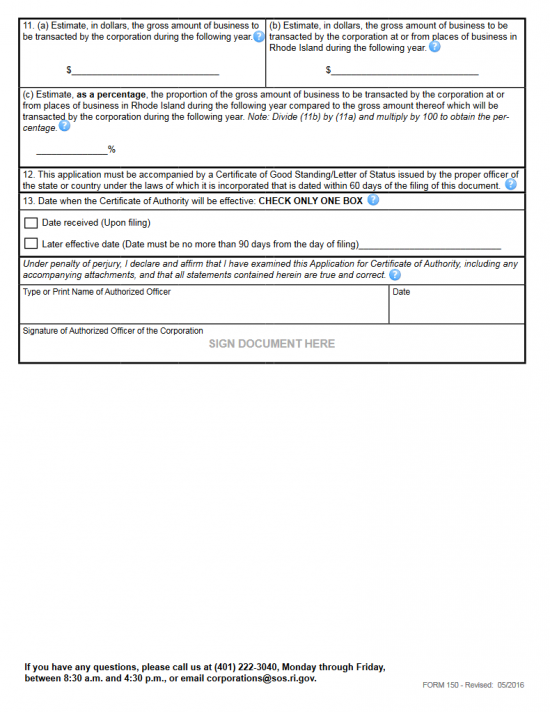 Step 2 - Once you are ready to fill out the template form, locate Item 1 then below the words “The name of the corporation is.” This must be reported exactly as it appears on the Certificate of Good Standing/Letter of Standing that is being submitted. Step 3 – Item 2 will require the jurisdiction where the filing entity (foreign corporation) is incorporated. This should be the name of the state the foreign corporation is or the name of a country and the appropriate area (i.e. province). Step 4 - The next section, Item 3, will concern itself with foreign corporations whose Name is not compliant with Rhode Island State requirements. Item 3a will be concerned with foreign corporations who do not have a word of incorporation as part of their Name. If this is the case, the filing entity must adopt one by reporting its Full Name with a corporate designator (i.e. Corporation, Corp., Incorporated, Inc., etc.). If this corporation may not operate under its True Name (for example the Name is already in use in this state), then it must obtain a Fictitious Name to operate under in Rhode Island. 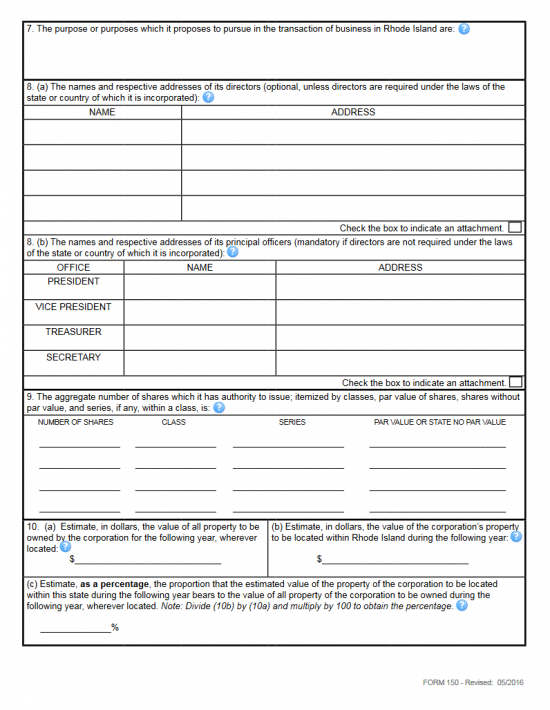 Fill in Form 624 (Note: You must add the $35.00 Filing Fee to the Filing Fee for the articles). Step 5 - In Item 4, enter the Date of Incorporation as it is documented with the governing body of its parent state. Then in the next section of Item 4 indicate how long this corporation has stated it will remain active in its home state. You will do this by checking one of the boxes. If the foreign corporation will remain active indefinitely, check the first box. If the foreign corporation will cease its activities on a specific date then check the second box and enter the Date of Dissolution on the blank space provided. Step 6 - In Item 5, enter the Full Address of the Principal Office of the filing entity on the blank line provided. This Address should consist of the Building Number, Street, Suite Number (if applicable), City, State, and Zip Code. Step 7 - Item 6 will concern itself with the Identity and Physical Location of the Registered Agent obtained by the foreign corporation. Under the words, “Agent Name,” report the Full Name of the filing entity’s Registered Agent on the blank space. Next, in the box, labeled “Street Address (NOT a P.O. Box),” enter the Full Address where the Registered Office is geographically located. Step 8 - Item 7 requires the Purpose of operating as a foreign corporation in the State of Rhode Island. This may consist of a statement that involves why and how this corporation shall operate in this state. Step 9 - Item 8 shall concern itself with the individuals or entities that serve as the filing entities governance. Item 8a is optional unless the parent state requires Directors in a corporate entity. There will be a table provided with two columns: Name and Address. Enter the Full Name and Full Address of a Director on each line. This must be a complete list. Item 8b is required if the parent state of the foreign corporation does not require the service of Directors in a corporate entity. If this is the case, enter the Full Name and Full Address of each Officer in this corporation in the table provided. There will be a line for the President, Vice President, Treasurer, and Secretary. Each section will have a box labeled “Check box to indicate an attachment.” If you must continue either or both of these lists on a separate sheet of paper and check this box in its respective section. Step 11 - In Item 10a, enter the total value of property(ies) estimated to be owned by the filing corporation in the following year. Then in Item 10b, enter an estimate for the total value of all property(ies) that will be owned by the foreign corporation in Rhode Island during the next year. Next, take the total value reported in 10b and divide it by the total value reported in 10. Multiply this figure by 100 then enter the result on the blank line in 10c. Step 12 - In Item 11a report an estimate of the gross dollar amount of business that will be done by the filing entity in the following year then, in 11b, enter an estimate of the gross amount of business to be transacted in or from the State of Rhode Island in Item 11b. You will then need to divide the total in 11b by the total in 11a, multiply that by 100, and report this in 11c. Step 13 – Item 12 will require that a Certificate of Good Standing/Letter of Status issued by the governing body or official record keeper of the filing entity’s home state to accompany these articles. The certificate must be less then 60 days old at the time of filing. Step 14 - In Item 13, you may designate whether the Certificate of Authority issued (if this is filed correctly) is upon a successful filing of the application by checking the first box. 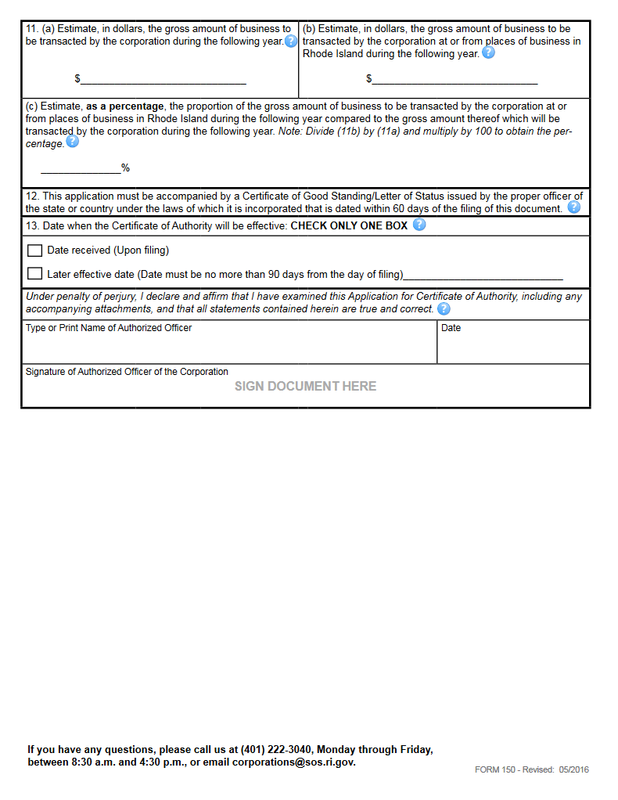 If you would like the Certificate of Authority to issued at a later date (within 90 days of filing) then mark the second box and enter the Date on the blank space provided. Step 15 - Next, after the verification paragraph, an Authorized Officer of the foreign corporation must Type or Print his or her Name in the box labeled “Type or Print Name of Authorized Officer.” Then, in the box labeled “Date,” enter the Date this application is being signed. Finally in the box labeled “Signature of Authorized Officer of the Corporation,” the Authorized Officer must Sign his or her Name. Step 16 - Next, you must fill out the Filer Contact Information page. This is a simple form which will give the Rhode Island Secretary of State the information necessary to contact an individual regarding this application and the information reported. Here, report the Full Name of the Contact, the Business Entity, Full Address, the Contact’s Email Address, and the Contact’s Phone Number. 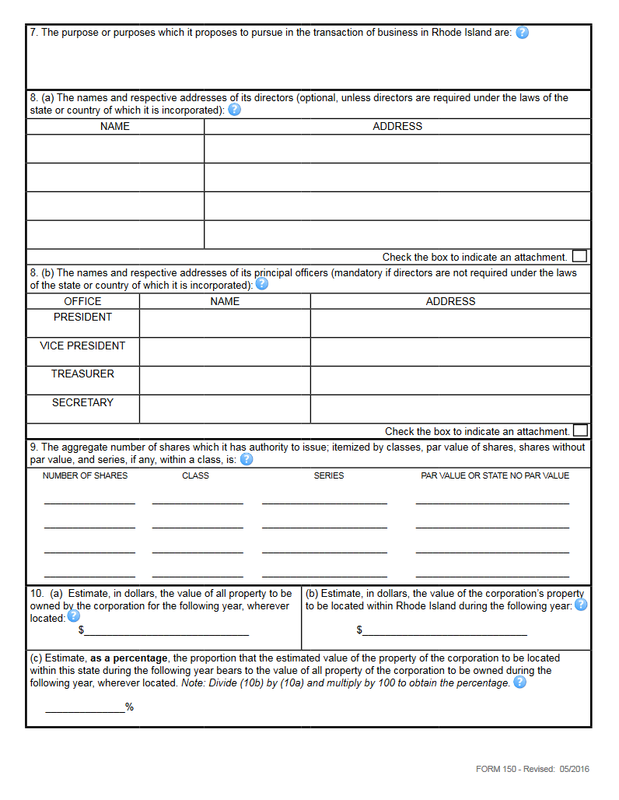 Step 17 - Now you must organize all the documents that should accompany your Rhode Island Application for Certificate of Authority of a Foreign Business Corporation | Form 150, including the Certificate of Good Standing/Letter of Status into one submittal package with Full payment of the Filing Fee ($310.00) plus all applicable fees. If submitting in person, you may pay for the Filing Fee and all other fees in cash, with a check, or by credit card. If mailing this package, the payment must be in the form of a check made out to Rhode Island Secretary of State.